​Community bat houses are large bat houses designed to provide roosting habitat for 5,000 or more bats. They are referred to as community bat houses because they are often constructed as a community project involving local businesses, volunteers and financial contributors. But the term “community” might also refer to the fact that a colony of bats can provide additional insect control for the community or that the colony of bats itself is a community of bats. An indirect benefit of a community bat house is that it indicates the community cares about its native wildlife and is willing to make adjustments for the impact we as humans have on our natural environment. Educational kiosks and programs at the site can be used to inform the public about bats, insects and environmental conservation. ​The keys to a successful community bat house are design and location. 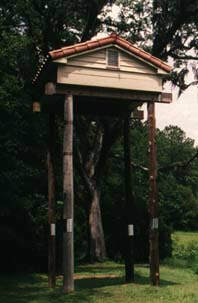 A well-designed and properly located bat house has a reasonable chance of acquiring bats within a few years. However, since there are no guarantees, the best we can do is design and locate a bat house in a way that increases the likelihood that the bats will find it, try it out and choose to stay.